VOGONS • View topic - SBPro1 CT1330A, lets solve the Reversed Stereo myth! SBPro1 CT1330A, lets solve the Reversed Stereo myth! I want to solve the "Reversed Stereo" controversy once and for all, but for that I need the help of a person whom actually own the original Sound Blaster Pro CT1330A card which is thought to have a reversed stereo... or is it the SBPro2 that is actually reversed? I tested a small number of game that behave strangely with several SBPro2 clone cards and want to test how the CT1330A behaves in comparison. Anyone with a SBPro1 CT1330A and willing to help, will be of great service to this community and its future generations. We have concluded that the SBPro1 CT1330A and SBPro2 CT1600 behave exactly the same with PCM audio, so everything besides the Dual-OPL2 is exactly the same. There is NO stereo reverse issue with the original cards, it's a 30 year myth. Last edited by James-F on 2017-6-11 @ 04:03, edited 3 times in total. Re: SBPro1 CT1330A owners, care to help figuring things out? James-F wrote: I want to solve the "Reversed Stereo" controversy once and for all, but for that I need the help of a person whom actually own the original Sound Blaster Pro CT1330A card which is thought to have a reversed stereo... or is it the SBPro2 that is actually reversed? The Sound Blaster Pro CT1330A is a Mono Card. It -does not- output stereo except for very specific titles that can use the card's two midi chips and do "stereo midi" effects. Otherwise all other games that don't use Dual-OPL2-Config will come out mono. Actually, I'm talking about PCM/Digital sounds specifically, not Dual OPL2 vs OPL3, and many games support stereo sound with the SBPro. Last edited by James-F on 2016-10-24 @ 12:15, edited 1 time in total. James-F wrote: Actually, I'm talking about PCM/Digital sounds specifically, not Dual OPL2 vs OPL3, and many games support stereo sound with the SBPro. Duke3D, Setup Sound Test, Reverse Switch Off (unticked). Tie Fighter, ship flyby sound Left to Right, reverse unticked. I'm telling you I own the card and I've used it. Sound only comes out on one speaker for anything other than dual-opl2 on these cards. So sorry.. stereo can't be "reversed" on the CT1330A because it doesn't have stereo. Wikipedia wrote: Model CT1330, announced in May 1991, was the first significant redesign of the card's core features, and complied with the Microsoft MPC standard.. The Sound Blaster Pro supported faster digital input and output sampling rates (up to 22.05 kHz stereo or 44.1 kHz mono), added a "mixer" to provide a crude master volume control (independent of the volume of sound sources feeding the mixer), and a crude high pass or low pass filter. The Sound Blaster Pro used a pair of YM3812 chips to provide stereo music-synthesis (one for each channel). Wikipedia wrote: The revised version, the Sound Blaster Pro 2, CT1600, replaced the YM3812s with a more advanced Yamaha YMF262 (OPL3). Otherwise it is functionally identical to the original Sound Blaster Pro. Kithylin, if your CT1330 only outputs digital sound on one channel, then I'm inclined to think there's something wrong with it. But it is stereo. Either mixer is set up wrong or there is a hardware problem (if you take a picture we'll try to solve this - simply a scratch breaking a PCB track or accidentally popped-off component could cause this). Try running Wolf3D, it uses the DSP to play mono sounds and uses the mixer to pan the sound towards a speaker where the sound would originate on screen. Sound and music should definitely come from both speakers. I'm inclined to agree. I have a CT1350B that actually IS mono-only for digital sound, and it outputs the same sound to both speakers. If there's digital sound only coming out of one speaker, that's not really how mono is supposed to work with these cards and is a sign that something isn't working right. I've never thought much of it and just assumed that's kinda how it worked.. I may have to look into it later.. I'll file that under my projects or something. I've never had good quality digital sound out of it anyway (always sounds crappy and terrible). The dual OPL configuration perhaps could produce FM music from one channel only with most everything addressing the first of the two chips. But that seems like a pretty large oversight for the production card. More likely both chips share the usual Adlib port and have separate second addresses for stereo soundtracks. keenmaster486 wrote: Kithylin, if your CT1330 only outputs digital sound on one channel, then I'm inclined to think there's something wrong with it. This thread is about Sound Blaster PRO CT1330A, which is the first card with STEREO digital audio, all else is irrelevant. Anyone has one installed on a nearby working retro machine and willing to run a few tests? I am trying to figure how the stereo audio was reversed and why games started to implement a reversed stereo switch in their setups. Also, why DOSBox has its SBPro emulation reversed to the real CT1600 that was/is much more common. I have one and it's in a group box somewhere... So if you'll still need help by tomorrow, I can find, install and test it. Just tell what/how exactly do you want to test it. The procedure is quite simple, first play Wolfenstein3D to hear if the channels orientation and speaker placement is correct, you can skip this step if you sure the left and right speakers are correctly placed. Or you can touch the Tip of the 1/8" TRS plug and listen for noises on the Left speaker. Doom: Test if PCM/digital sounds come from the proper side, or are they reversed. Duke3D: Test the sound sample in the Setup utility without the reverse switch (unticked), should sound correct. Tie Fighter: imuse.exe setup utility, in the sound test the ship flyby from left to right, reverse switch unticked. Descent: setup.exe, do the sound Test (Twice, accept then again, important) and hear if the channels are correct with reverse stereo disabled [make sure StereoReverse=0 in descent.cfg file]. Quake: sound should be correct. * Please select the SBPro setting in all game setups. Also, please test THIS SBTEST app (attached) by the developers of DOSBox and report what you hear, this is the most important test. On the CT1600 I hear the sound twice on the Left channel, while in DOSBox it is first Right then Left.... none of my SBPro (and clones) cards behaves like this. The SBPro plays stereo by interleaving the left and right bytes, and it is thought that the CT1330A behaves differently that the CT1600, this is what we trying to figure here. Harekiet wrote: Made a little test app that plays 8bit stereo with and without a single byte start transfer. These tests should suffice to tell how the CT1330A behaves in contrast to CT1600. I really appreciate your help, this will help the developers of DOSBox understand more and fix the emulation, because clearly they still have issues with understanding how the Stereo of the CT1330A works and very well may be that it is emulated wrongly. I attached a small soft SBCHECK which tells what card it is and what DSP. Also SBTEST by DOSBox developer Harekiet to test how the SBPro behaves. Last edited by James-F on 2017-6-11 @ 04:05, edited 6 times in total. The beep sounds from the LEFT speaker in both tests. There is a chance SBTEST fails , beep ends and you get the "waiting irq " message printing forever. Last edited by keropi on 2016-10-24 @ 12:54, edited 1 time in total. Thank you for testing keropi. This confirms that all CT1600 revisions behave the same. Last edited by James-F on 2016-10-26 @ 05:25, edited 1 time in total. Both tests come out the LEFT speaker (the right has some sort of parasite during playback, need to investigate that) just like in your chart. 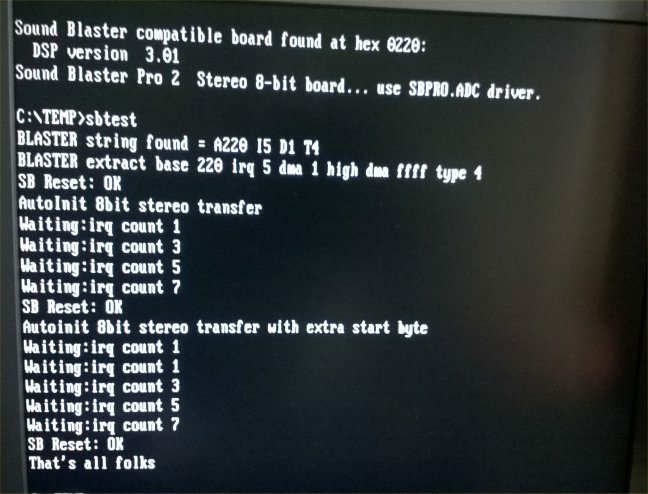 That actually confirms that any revision of the SBPro2 will NOT flip the stereo if an extra byte is sent before the PCM stream, it will always starts new PCM stream from the first sample, no matter on what sample the previous stream ended on. The same cannot be said about the clone cards. If I'm not mistaken, SBTEST.EXE plays a sinus wave only on the left channel, which according to the sound blaster programming guide should be only ODD samples 1,3,5,7 which go to the LEFT channel on the first test. On the second test it inserts extra byte before playing the PCM sinus resulting in the sinus first sample starting to play on the second EVEN sample thus reversing the Stereo. This is not the case with the SBPro2 which always starts new PCM stream from the first sample, no matter on what sample the previous stream ended. It is believed that the SBPro1 CT1330A ignored the first sample and starts to play the left channel on the second sample which resulted in reversed stereo. I am still waiting for someone with a CT1330A to perform the tests and confirm the theory. * The artifacts on the right channel is just how the SBPro works, the stereo separation is never crystal clear. Great. I'm also curious whether the stereo bug started with the original SB Pro CT1330/CT1330A or if it's actually something unique to later clone cards. Hope we finally hear it from an owner here. I actually do have a CT1330A Revision 6.. I just have to get out my 486 and play with it.. got a lot going on today to get to it. maybe later tonight. And don't know if mine is broken or not. EDIT: Not true: Tie Fighter floppy version has correct stereo audio FX. I must have screwed up something while testing earlier. Last edited by Jolaes76 on 2016-10-26 @ 09:20, edited 2 times in total. To avoid confusion, Jolaes76 tested again and indeed his CT1330A Rev5 behaves exactly like CT1600. Last edited by James-F on 2016-10-26 @ 12:49, edited 2 times in total.